It’s hot. It was raining ten minutes ago and I’ve just returned from touching up my smudged makeup in the bathroom — only to start sweating it off again the minute I get outside. I’m waiting for my friend who has spent the whole morning applying her full body paint, only now arriving at the convention at 2pm. She’ll probably leave again in two hours just to start taking it all off again. This is the PAX experience for your average cosplayer. 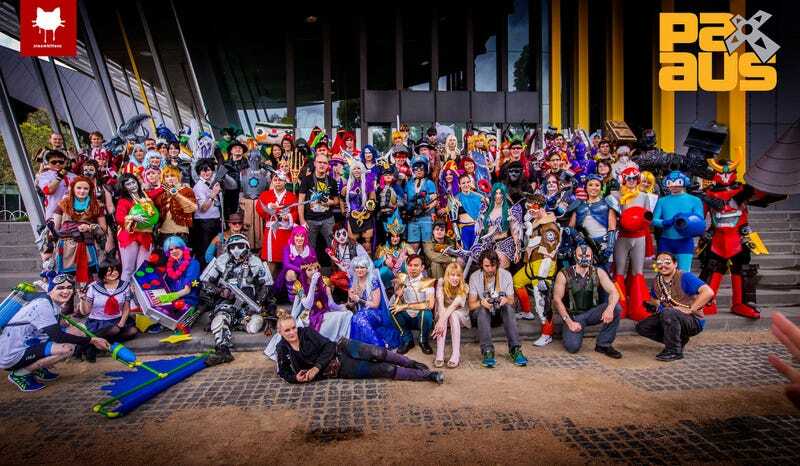 Despite having no cosplay competition or even a showcase or parade — aside from the smaller ones run by exhibitors — PAX Australia is one of the biggest events in the cosplay calendar. Every major game series, from League of Legends to Assassin’s Creed to Dragon Age, held huge group gatherings across the three-day weekend. Ubisoft had its own cosplay corner, while Smite and Fallout 4 both had a group of people in shiny, shiny costumes to attract attention to their booths. While the idea of a PAX without cosplayers is as unimaginable as a PAX without queues, cosplaying to PAX usually means that you’ll rarely even make it into the parts of the convention that require a badge. I managed to get as far as the edge of the indie area at one point before a number of factors — a huge, unwieldy prop gun, a message from a photographer and crowds on all sides — made sure that I didn’t get to stay for more than five minutes. Even for the short period I was inside, being in cosplay makes everything much more difficult than it should be. I spotted a short queue on one of the VR-based indie games that I had just missed out on the day before, and was making my way over before I realised what a poor idea that was. With a finicky wig, a headpiece and a face covered in sticky fake blood, VR gaming would not be happening for as long as I wanted to stay in that costume. There’s a solid reason why most cosplayers at PAX tend to congregate either in the hallway or on the outside promenade — and where the cosplayers go, the photographers follow. Or perhaps it’s the other way around. Cosplay photographers — or at least the most serious of them — don’t seem to have any better luck with getting inside the convention to relax and play games. When there are thousands of talented local and interstate cosplayers who have brought their A-game, many photogaphers don’t want to risk missing a good shot. It wasn’t an uncommon sight over the weekend to see a photographer settling in a dark corner or a scenic spot outside for the long haul, getting as many different costumes in front of their lenses as they could. But while I, and many other cosplayers, didn’t get to see near as many things in the Expo Hall as I wanted to, I wouldn’t change it for the world. Coming out of a panel on Saturday afternoon (luckily, panels are one of the things that can be enjoyed in costume in relative comfort) I was amazed to see just how many cosplayers had filled the hall. It was a testament to the skill and diversity of the Aussie community that you couldn’t take a step without running into a brilliant costume or three. Local bars and restaurants were filled with characters from every game imaginable, and the river was being used all weekend as a backdrop for thousands of photos. If you managed to snag an awesome photo of a cosplayer over the weekend — or even if you’re enjoying seeing all the incredible pictures that were created, take a moment to appreciate the time that cosplayer took to share their passion with the community. Wearing a wig, heels and full prosthetic makeup for an entire day isn’t the most comfortable thing to do at a crowded gaming convention — but of course we wouldn’t do it if we didn’t love it. Next time, though, I swear I’m going to wear a cosplay I can also game in. Maybe.